Where do you need the roofing expert? The average roofing installation price for a spray foam roof costs anywhere between $6,000 to $7,200 depending on the slope, pitch, and size of your roof. You can expect to pay $2.50 to $3.00 per sq. foot or $250 to $300 (1″ of Foam) per square installed on a standard sized single story home. Costs will vary depending on local roof contractor’s pricing. View your potential roof installation savings with local contractors below. It’s always smart to get price quotes from at least four local pre screened and licensed spray foam roof installers before starting your roof replacement project in order to get the best price in your area on your foam roofing installation. Foam Roofing Life Expectancy: 50+ years. High Insulation Helps Save on Energy Bills. Polyurethane foam roofing can be applied over an existing roof, but it does requires a clean surface for proper application. It must be dry and free of contaminants like oil. The final step of the process is the application of a protective elastomeric topcoat. The topcoat is essential to protecting and sealing the foam roofing from potential damage caused by the sun’s UV rays, stretching (due to temperature changes), moisture, and fire. Spray foam roofs are significantly lighter than traditional roofing systems like asphalt, putting less stress on the frame of your home. Spray foam roofing is also able to prevent standing water, a common problem with conventional roofing systems. To do this, your installer will build up areas of greater foam thickness while spraying so that water will drain properly. Without this safeguard, water accumulation could lead to a roof collapse. Every 10 or 15 years, depending on the type and amount of foam roof coating installed, your spray foam roof will need to be cleaned, primed, and recoated. If this is done, then a good-quality spray foam roof could last 50 years or longer. As much as 40% of your home’s energy is lost due to air infiltration. Spray foam roofing prevents even the smallest gaps, cracks, and holes from which valuable energy could escape. SPF has the best insulating properties currently available. 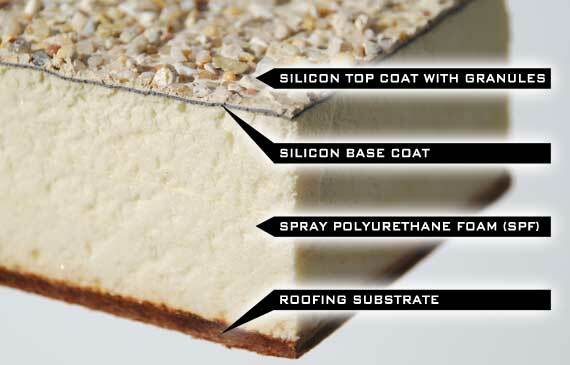 SPF roofs also reduce thermal shorts, because unlike shingles they do not require metal fastening since the foam bonds directly to the roof deck in a continuous layer of insulation. The Department of Energy estimates that 56% of the energy used in your home goes toward heating and cooling, so using SPF as a safeguard against energy leaks will have a big impact on your monthly utility bills. In terms of your environmental footprint, SPF roofs can also be applied over your existing roof, saving significant demolition costs and diverting waste from local landfills–traditional roofing products contribute an estimated 20 billion pounds of waste to U.S. landfills on an annual basis. Here are some other helpful pages to prepare you for your roofing repair or replacement project.